Our indoor/outdoor custom logo mats are made using tough fabrics with rubber backing and edging. 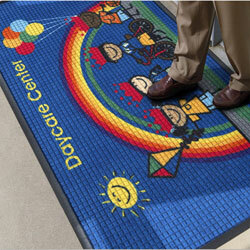 These mats are mainly used for entryways, indoor or outdoor, with high foot traffic. Imprint method is fabric inlaid; high definition printing is done on weather proof fabric. Either method gives you a distinctive and durable custom logo image. Weather proof fabric inlaid mat. Designed for high traffic using logo inlay process. Heavy duty fabric with waffle pattern. Rubber backing and borders. High definition digital printing using a weather proof polyester material makes the Waterhog Impressions HD an excellent choice. Designed for heavy traffic. Premium fabric inlay mat great for large areas. 45 oz/sq yard heavy needle punch fabric. Berber pattern with recycled rubber backing and PVC edging.